Figure 1: A selection of 1000 Watt FEL Standards of Spectral Irradiance used for Calibrations. Biospherical Instruments maintains several standards that are traceable to the NIST/FASCAL irradiance scale.Irradiance and radiance calibrations performed at Biospherical Instruments are based on FEL Standards of Spectral Irradiance (Figure 1). 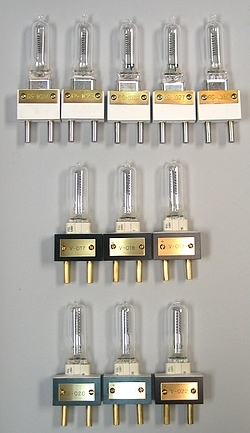 These standards are 1000 W tungsten halogen incandescent lamps, operated at a constant current of typically 8 A. Their calibration is traceable to the National Institute of Standards and Technology (NIST). The operation of FEL lamps requires highly accurate power conditioning as the output of these lamps at 300 nm changes by about 1% for every 0.1% change in the operating current. To achieve the desired accuracy of less than 0.1% in the output, the current has be set to better than 0.01%. This level of accuracy is not achievable with commercial off-the-shelf, digitally-controlled power supplies because of their poor step-resolution. To meet these demading power requirements, Biospherical Instruments maintains a state-of-the-art lamp power system (Figure 2), consisting of a power supply with analog control input, a high-precision voltage source, a high-accuracy shunt (not shown), a high-quality digital multimeter (DMM) for monitoring the voltage across the shunt, electronics to power ancillary components, and a high-capacity uninterruptible power supply (UPS) to prevent sudden power losses at the lamp in case of a power outage. LabVIEW software was developed to set, display, monitor, and control the lamp current, and to record all measurements and ancillary information (e.g., cumulative lamp use) into databases. With this system, it is possible to set and maintain the lamp current to within a precision of ±50 μA (0.0006% for a target current of 8.2 A). The accuracy of the current is only limited by the calibration uncertainty of the shunt, which is to within 0.002%. 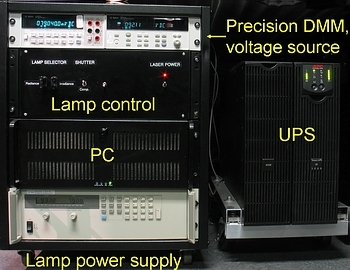 Figure 2: The power system for irradiance and radiance calibrations.In addition to the demanding power requirements, accurate alignment of lamps and radiometers is mandatory for achieving accurate calibrations. Lamps are mounted in a kinematic lamp socket designed by NIST, which in turn is attached to a stack of several linear and tilt stages, allowing precise alignment with respect to six degrees of freedom. Final alignment is performed with the help of a laser (Figure 3). For more information on BSI's lamps, please refer to chapter 6, "Lamp Library Performance" from the NASA TM titled, Optical Sensors for Planetary Radiant Energy (OSPREy): Calibration and Validation of Current and Next-Generation NASA Missions, NASA TM# 2012—215872.